TORONTO – Turns out that Canadian television viewers aren’t much different from those in other countries. Research shows that in-home viewing promotes “household bonding” while providing a much-desired cultural connection to the outside world. Not that the advertising industry knew this instinctively. 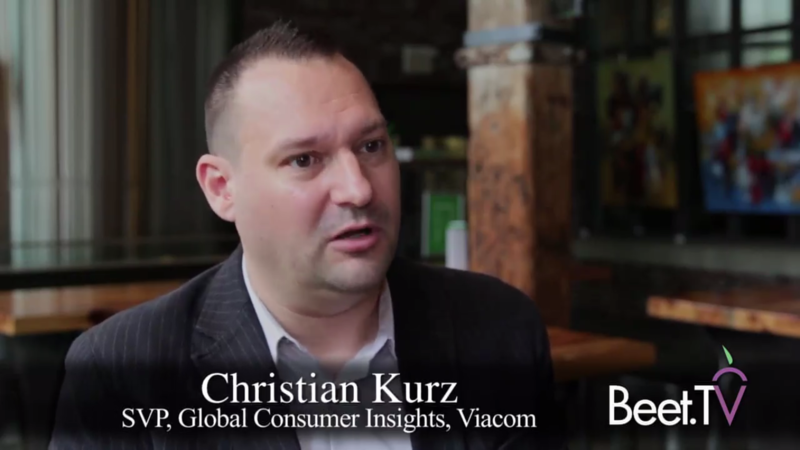 In fact, it’s been looking in the wrong direction for awhile, according to Christian Kurz, SVP, Global Consumer Insights, Viacom. Kurz believes the future will bring more live programming and events to get people to watch programming at a specific time. Watch the interview on Beet TV. “As a media industry, as media executives, we have a very warped view of the world, particularly when it comes to media consumption. We are just not normal,” Kurz says in this interview conducted by Beet.TV contributor and Furious Corp. CEO Ashley J. Swartz at the recent Future of TV Advertising Forum. “And we completely misrepresent what the rest of the population does,” Kurz adds. Those are among the reasons why organizations like thinkTV set out to ask viewers what they really think, beginning with their definition of television. It is anything that is professionally produced video content between seven and 90 minutes—which leaves out short-form video and movies. “That really means that when they talk about television, they have a slightly different conversation than we have in the industry ourselves. So we kind of need to recalibrate with that,” says Kurz. In recent thinkTV research, survey respondents in Canada had to give up watching television for 10 days. “People completely underestimated how television brings people together” both in the home and “also in the wider world, the cultural connection,” he says. “Would you call it escapist?” Swartz asks. “It’s incredibly escapist. That’s essentially what it is. It’s escaping reality,” with the exception of news programming.